Transform Your Patio and Lawn Areas with a Water Feature Powered by Solar energy, Create a Focal Point in Your garden & Enjoy the sight and sound of Relaxing Trickling Water. 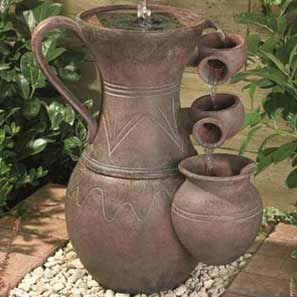 Powerbee offer the BEST Prices on Garden Water Features, Our Prices Include Guaranteed Delivery and VAT. We use Royal Mail 48 GPS Tracked Service, at NO extra cost. PowerBee Ltd have been Specialising in Solar Pumps for nearly 10 years, we have Selected only the Best Fountain Features, many incorporating our Famous Sunspray Range, which have battery backup as standard. Our Range of DIY and Ready Made Solar Powered Garden Features, are designed to Generate Power very efficiently from Light, Our Features are Now Mainstream for Gardens all over the UK.